Will LeBron James Battle Age Like Kobe? Or Like Bird? There is no doubt about what James has brought to the floor in his career. He has been named league MVP four times. He has won three NBA titles. He has been named to the All-NBA first team 12 times (Michael Jordan was only named 10 times). His box score statistics have been worth more than 240 regular season wins (Jordan produced less). And for all that effort, James has so far been paid — at the conclusion of the 2017-18 season — about $237 million. This past summer, though, we learned James is going to see his NBA career earnings increase substantially. The four-year contract James mentioned will pay him $153.3 million across the next four seasons. Given all that James has brought to the table, we might imagine the Lakers didn’t give a second thought to committing this much money to such an amazing talent. 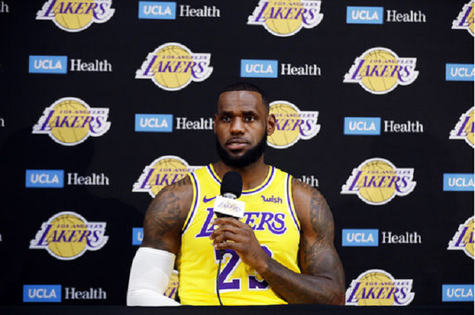 But despite all the numbers noted so far, there is one number that should give the Lakers and their fans reason to think a bit about what James will bring to the table across the next four seasons. Right now, James is 33 years old. But on December 30, 2018, he will be 34 years old. And when his four-year contract ends he will be 37 years old. For an actor, or spokesperson, or philanthropist, or father (other jobs James does), 34 or 37 is not necessarily that old. For a basketball player, though, celebrating your 34th birthday tends to be a real problem. We might think that athletes age like fine wine. But the data says that most basketball players age like milk. In other words, we know what James has brought to the table in the past. What we should ask is what the Lakers can reasonably expect to get from James across the next four seasons. The study of age and player performance in the NBA indicates that performance tends to peak sometime in a player’s mid-20s. But after that peak, the initial decline is rather small so a player in his late 20s doesn’t necessarily look much different from what you have seen before. However, once a player enters his 30s the decline becomes much steeper. And the older he gets, the steeper tends to be the fall. One doesn’t have to look at player performance to see evidence for this story. All one needs to do is look at what happens to a player’s playing time as they age. Last year James played 3,026 minutes for the Cleveland Cavaliers. According to Basketball-Reference, there have been 4,179 players who ever played in the NBA since 1946. Of all these players, only 17 ever played more than 3,000 minutes in a single season at the age of 33 or older. Beginning in 1973-74 the NBA has tracked all the statistics necessary to measure how many wins a player statistically produces. Since that year, 12 players have been like James last year (i.e. logged 3,000 minutes in a single season at an advanced age). On average, these 12 saw their minutes decline the next year by 605 minutes. In addition, their average on-court productivity also declined. If James repeats this average decline, his production of wins will decline from the 21.3 wins he gave the Cleveland Cavaliers last year to just 15.8 wins in 2018-19. Last year James was the most productive player in the league. If he follows the average decline, he probably won’t be the best player in the league. But, he will still be a top 10 player. In other words, a drop of more than five wins still means James is very good. But what if James does worse than average? What if James becomes like Kobe Bryant? In 2012-13 — at the age of 34 — Bryant played 3,018 minutes for the Los Angles Lakers. That season he was was still the Bryant people had always known (i.e. an above average shooting guard). But then he got hurt. The Kobe Bryant that eventually returned to the court was most definitely not above average. After the 2012-13 season, Bryant played in 107 regular season games. An average player in the NBA has an effective field goal percentage close to 50%. Bryant’s effective field goal percentage, though was only 41% in the last 107 regular season games of his career. Only 22 times did his mark pass the 50% threshold and 47 times his effective field goal percentage in a game was below 40%. In sum, Kobe was very much a below average player after he played more than 3,000 minutes in the 2012-13 season. Of course, Bryant got hurt. LeBron James isn’t hurt. So, maybe James will be able to defy age like Sue Bird. This past season Bird led the Seattle Storm to the WNBA championship. She also was one of the ten most productive players in the WNBA. All of this was accomplished despite the fact Bird is 37 years old. As noted a few days ago, what Bird did in the WNBA this past season simply hasn’t been done by anyone in the WNBA or NBA in history. Although no one has been as good as Sue Bird at 37, she is not the first person to play productive basketball at 37 years of age. John Stockton and Jason Kidd were also very productive at that advanced age. Perhaps LeBron’s path forward will be similar to these players. It is likely the future depends on LeBron’s ability to avoid injury. Although the sample is quite small, it does seem like the players who are able to produce at an advanced age tend to be point guards. Recently Dr. Abigail Larson — a professor of Physical Education and Human Performance at Southern Utah University — offered some speculation on why smaller basketball players were better able to resist aging. James definitely plays like a point guard. But no one is going to describe him as smaller and lighter. That suggests — and again this is just speculation — that he might not be as injury resistant as the aforementioned smaller players. Once again, all this is speculation. We don’t know yet how age will ultimately impact LeBron James. We do know that age — as it has done to every player in NBA history — will eventually end LeBron’s career. And we do know that most every player simply stopped playing much at 37 years of age (the last year of LeBron’s Laker deal). In the history of the NBA, only 20 players logged at least 2,000 minutes in a season at 37 years of age or older. Again, there have been more than 4,000 NBA players in history. So, it is immensely rare that a player sees the court much at 37 years of age. And it is even less common for those players to produce many wins. LeBron, though, has spent an entire career doing stuff that virtually no player in NBA history ever did. So it is not hard to believe he will continue to do this with respect to age. But if you are a Laker fan, you might wonder if all that LeBron James brought to the floor in the past will still keep showing up on the floor of the Staples Center the next four years. All content provided on courtsideaccess.com, including content posted by users, is for general information, discussion and entertainment purposes only. Courtsideaccess.com, and all of its affiliated entities, make no representations or guarantees about any aspect of the content on courtsideaccess.com and do not endorse any opinions expressed by any users.